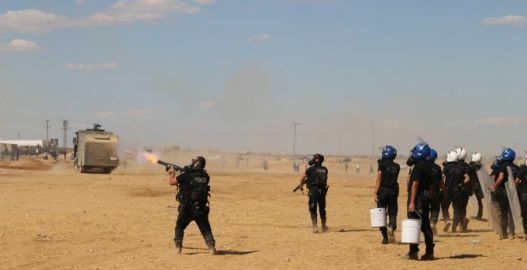 Nonetheless, we find that this dispatch posted by a visiting activist last month has retained its currency, as it contains tales of the experiment in Rojava in its barest form, told by people who live it. We recognize that it is only a narrow sliver of the current multi-layered situation in revolutionary Syria at large; for more comprehensive accounts, we encourage you to read “friendly doctor” Leila al-Shami’s latest essay and/or this interview with Syrian revolutionary scholar Joseph Daher. I have made it to Suruç, a city in Turkey that forms part of the border with Syria. The war is everpresent. And the Turkish military is, too, with its armor and water cannons. The population in the smaller town where I am currently staying swings from a few hundred to several thousand the next day and then back again; many are fleeing from here, but many are also arriving, wanting to get over the border to join the resistance in Kobanê, to fight in the ranks of the YPG/YPJ, to deliver food, hustling up whatever way they can think of to help. Constant fluctuation is the rule. Over and over again, the Turkish military goes on the attack, using water cannons and teargas to drive people away from the border. 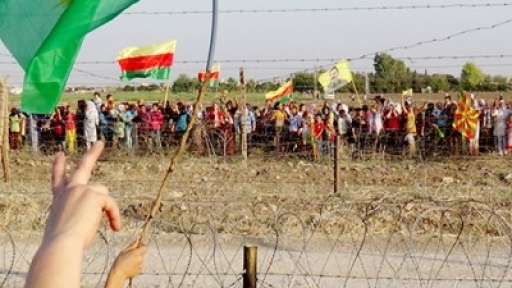 Turkey is trying its best to impede any support from reaching Kurdish fighters. 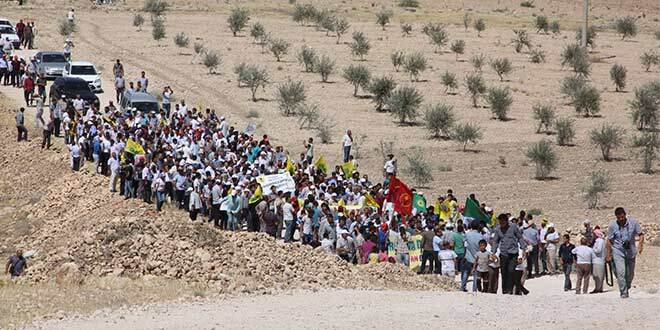 Hundreds of thousands of people have already fled from Kobanê into Turkey. People in Suruç have opened their homes to the refugees. Anywhere from several dozen to several hundred people live provisionally in every available structure. Despite lack of the barest necessities, life goes on. Discussions last all day; information about developments in Kobanê gets passed along; the situation changes minute to minute. Nobody has any idea what could happen before sunup, or what tomorrow will bring. In spite of everything, there is much laughter. Interaction among people is tender; everyone looks after each other; everyone helps everyone else; no one is left alone. What little there is, is shared. I heard that yesterday ISIS reached the city center of Kobanê through the sewer system. The YPG was able to fight off the incursion, however, and ISIS fighters retreated back into the sewers, where they were then bombed overnight by the U.S. and France. Every day between four and five in the afternoon, fighting between the YPG and ISIS begins. Overnight the bombs of the Americans and others making up the “alliance against ISIS” rain down. During the day, U.S. aircraft circle the city. Because the region is relatively flat, I can hear and see the aircraft, the bombs, the smoke, everything, from here. The events are only a few hundred yards away. I can also see the low hill that last week fell into the hands of ISIS. It is a location of special strategic importance because the entire city of Kobanê can be observed from there. Last week there were pictures in the media of ISIS flags raised there. Since then, though, the hill could be retaken and is now back in the hands of the YPG. Still, it is presently empty of people—this because at only one hundred yards’ remove stands another hill which is occupied by the Turkish military. I speak with people from Kobanê who have fled here to Suruç. They tell me about the citizens’ assemblies, the self-governing structures. Before I came, I wasn’t sure if the reports I had read and heard were true. Could it be that these tales of Rojava, the liberated region, were embellished? Will I hear from fleeing former Rojava residents that the self-governing structures don’t really have much bearing on day-to-day life but operate rather on the fringes while familiar party structures make up the actual government? But when I speak with residents here, I find that my doubts are unfounded. On the contrary: I am gaining higher esteem for the developments here, as I hear firsthand reports from youths, women, and elderly gentlemen. They describe the citizens’ assemblies, how everything is discussed and decided collectively, that everything is managed “from below.” They tell me about the women’s committees, the communes. What most astonishes me is that to the citizens of Rojava, these structures are not as big a deal as they often are to us hundreds of miles away. For them it is everyday life. They do not speak of “revolution,” but rather talk about something that is, for them, obvious and mundane. There is nothing special about it. An older woman tells me about the structures in Rojava and paints a picture of a real-existing libertarian society, without using any theoretical terminology or throwing around the names of whatever libertarian gurus. Presumably she doesn’t know them, and that doesn’t matter in the slightest. Terms and names are superfluous, when there is reality. She is convinced that a state would protect the population. “If we had a state, we wouldn’t be getting attacked from all sides. Or at least we would have support from other states.” She then relates that she had to give up ninety percent of her land’s yield to regions with no agriculture, because it was decided in the citizens’ assembly that goods should be as evenly distributed as possible to meet the needs of all; there should not be abundance in one place when there is shortage in another. The woman I spoke to would rather keep her entire yield, or at least a greater portion of it. I see how alive the revolution in Rojava is, and also the discrepancies that come with it. Under a dictatorship, everyone is supposed to think alike. Here there are varied perspectives—that are also communicated freely and openly. I heard about a survey that was conducted in Rojava by the committee for research and statistics. The goal was to suss out which political system the citizens of Rojava wanted. Almost 70% stood behind the idea of democratic federalism. Around 30% wanted something else, for instance an Islamic or a national state, or a capitalist system. Against all odds, the region has maintained this form for over a year now, and proves much stronger than anyone expected. When ISIS marched on Kobanê, everyone assumed that the city would succumb in a few days. But the population is resisting. Everyone has armed themselves, everyone does guard duty. And now ISIS is retreating; more and more parts of Kobanê are being retaken.